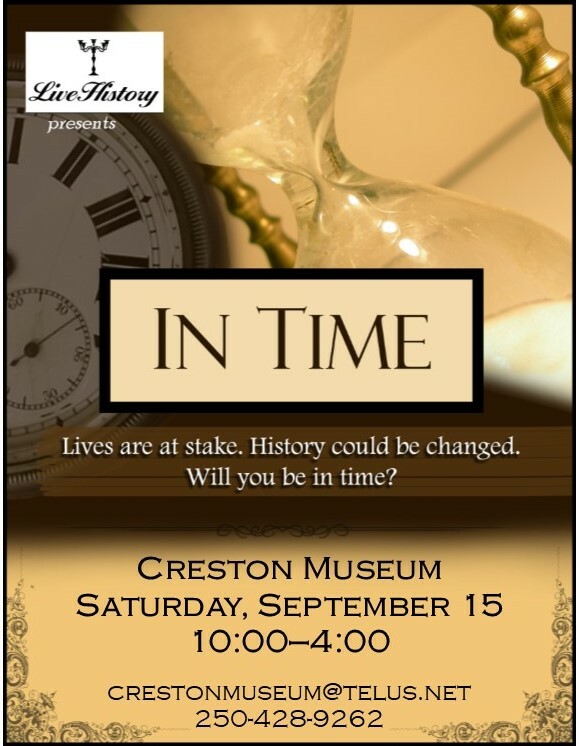 Join us for a day of interactive history theatre! 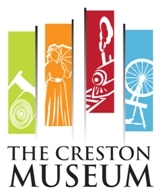 There are many people milling about the Creston Museum, and YOU are one of the lucky few who have been granted an audience with the one in charge. BUT: you have been given a task – a challenge – a mystery to solve – and it must be completed before your audience time or you will not enjoy the consequences. Will you have to clean the latrine? Crush the grapes individually? Clean the floor with a single blade of grass? Or will you be rewarded for your hard work? The clock is ticking. The sand is slipping through the hourglass. Lives could be at stake; history could be changed. The whole world rests on your shoulders, and time is running out. Will you be in time? Come on your own or with a group – solve the mystery on your own or challenge your friends! Saturday, September 15. Expect to spend about an hour and a half at the Museum, completing your challenge and meeting the one in charge. A new challenge begins every fifteen minutes throughout the day from 10:00 to 4:00. Suitable for all ages. $10 per person. Coming with a group? Book five or more people for just $50! Tickets available at the door or by purchasing online below. Need more information or prefer to book in person? 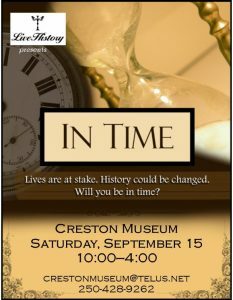 email crestonmuseum@telus.net, or call 250-428-9262.